According to the CDC, chronic diseases, such as heart disease, cancer, and diabetes, are responsible for 7 of every 10 deaths among Americans annually. These chronic diseases can be largely preventable through close partnership with your healthcare team, or can be detected through appropriate screenings, when treatment works best. The right preventive care at every stage of life helps all Americans stay healthy, avoid or delay the onset of disease, keep diseases they already have from becoming worse or debilitating, lead productive lives, and reduce costs. South Central Regional Medical Center invites you to join us for a lunch and learn on Friday, July 13th at 12 p.m. to learn how preventative healthcare can provide better quality of life. 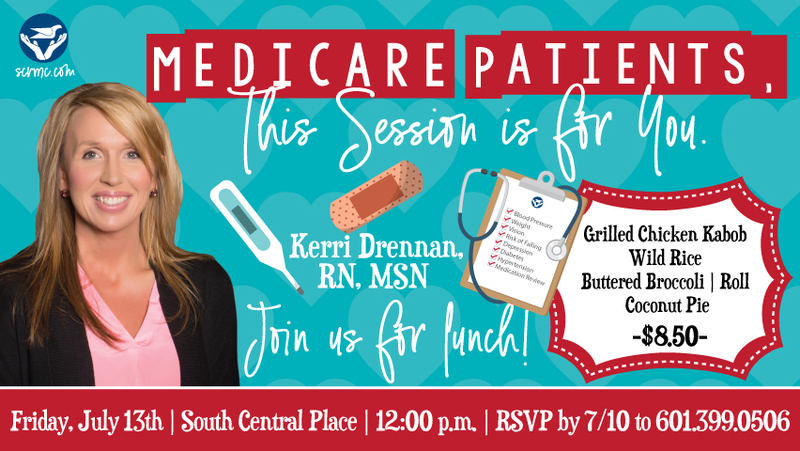 This luncheon will feature guest speaker Kerri Drennan, RN, MSN, Population Health Nurse. To register for the luncheon, please call 601-399-0506 or email kvanderslice@scrmc.com. The event will be held at South Central Place in Laurel at 2260 HWY 15 North. Registration is $8.50 and includes lunch.